You’ll know summer’s in town when you see the people you admire sporting everything that’s summery, right from the bright prints on their clothes to their big funky accessories. And speaking of summer accessories, celebrities Jessica Kiper and Phoebe Price boldly wore fabric hair pieces in keeping with the season’s trends. Big hair bows are quite popular this summer. While many would prefer to flaunt their bows with the help of a clip or a hair-band, you could fashion yours the way Jessica Kiper did when she arrived at the Batman Product Line Launch at the Meltdown Comics on March 21, 2013 in Los Angeles, CA. For her look, Jessica used a colourful strip of textured fabric and had it tied around her head to form a fashionable bow at the front, with a knot at the centre. Tying her hair up in such a way accentuated her short hair style with bangs and showed off her lightning bolt earrings to great effect. Coupled with her saucy smile, she looked ready for the event! Every fairy-tale Princess has worn one of these. 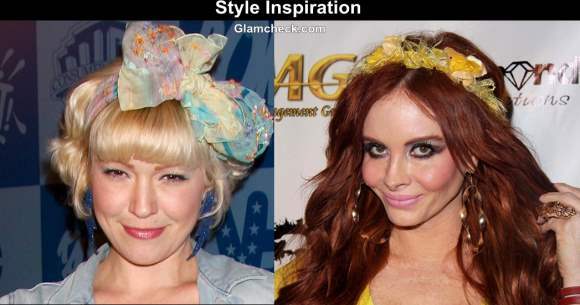 But instead of using flowers in your hair, you could try out a contemporary version of this hair accessory like the one Phoebe Price wore at the L.A. Fashion Week L.A. Runway at the Mansion in Los Angeles this March. Using shades of yellow to make a crown was a very clever way to accessorize her hair considering she’s a redhead. A circle of bows and flowers on her head was perfect to complement both her hair and her dress. Tip: If you have dark hair, make sure to use hair accessories that are brightly coloured so that they can stand out more. Now you too can get set to rock this summer with creative hair accessories that are bow-ed and beautiful.